Elanza DigiMesh™ technology is essentially an Outdoor LED solution which can be installed on any kind of building surface making the outdoor LED solution extremely flexible, light weight& brighter and most importantly independent to install on any kind of surface contour. ElanzaDigiMesh™ LED solution is perfect for curved building surfaces and glass wall high rise buildings that need transparency, as the display can adapt to any building contour. Elanza DigiMesh™ is available in Outdoor LED configurations from 10mm to 24mm, and provides transparency and see through capabilities upto 60% for glass surfaces. 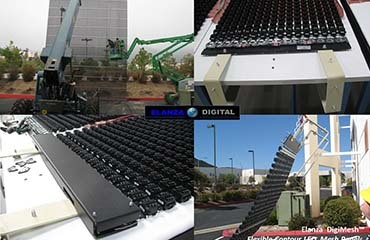 Unlike bulky , cumbersome fixed frame displays that limit the size, adapatibility and flexibility of traditional LED cabinet displays, Elanza DigiMesh™ offers the capability of larger , lightweight and far brighter outdoor LED display capability that will dazzle the viewers from distances far and wide. 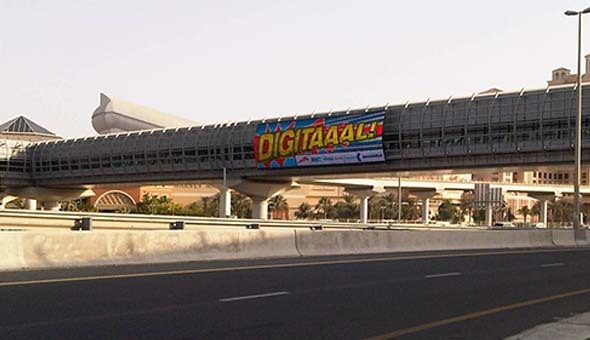 Elanza DigiMesh™ is flexible enough to wrap around the corners of buildings and large enough to dress an unprecedented 30 stories or more. This is a highly specialized LED technology and each display is custom built by Elanza Technologies using Cree or Nichia LED chips. 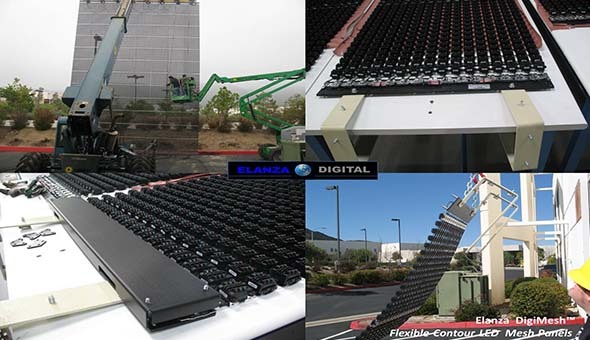 More specifically each Elanza DigiMesh™ display is custom built to meet the building contour and elevation requirements, and custom fit requirements. Pixel Pitch Range from 10mm to 24mm. Curved Building Surfaces, High Rise Glass Towers, Contoured Bridges., etc. 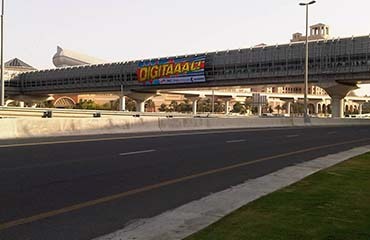 Large scale digital visiualization on highways/ roads. © All Rights reserved Elanza Technologies Inc.